A beautiful frypan to look at and, more importantly, to use! I only recently discovered Falk cookware and I've already started to build my collection piece by piece, and nothing disappoints. 367 customers found this review helpful. Did you? Yes, I did! The great size pan for all the fry task. Big enough to everything. Feel not as heavy as the saucier. It's a great size and shape! If u can only buy one copper, get this one! This was my first time venturing into buying what I call Premium Grade pan. I had always used generic Cast Iron and Stainless Steel pans. I had had enough with the low quality of these pans and I decided now I had the money to purchase a Copper Pan and I noticed straight away it was the right choice. If you want to discuss looks then the Copper Frying Pan just looks stunning compared to any of the other types of pan you can buy. The delightful auburn-ish shine it gives off is a sight to behold. Now down tot he actual cooking ability. I always test a pan by it's ability to fry Steaks. I fried 2 Rump Steaks on it and they came out the best I had ever tasted. Due to no hotspots existing it was cooked exactly the same all over and there was an amazing sear. I would definitely recommend anyone to purchase this pan. 467 customers found this review helpful. Did you? Yes, I did! Beautifully made, heats up so quick, would like a full set in time, will buy again in the future, great service, super fast delivery! Many thanks. 469 customers found this review helpful. Did you? Yes, I did! Amazing, the best piece of cookware I have ever bought. I expected it to be good but I was still blown away by the sheer quality and the weight whenever I unpacked it. Each time my father buys a new car he always says that it will be his last as it will outlive him; my son already has his name on this pan!! I've just received the 28" frying pan, which is both sturdy and elegant at the same time! It arrived the next working day after ordering and was well packaged with plenty of polystyrene pieces to prevent any harm coming to it in transit. The frying pan is quite heavy, which won't suit everyone, but I'm sure this will give many years of loyal service in my kitchen. I would definitely recommend the 28" frying pan, which seems to be the ideal size for my requirements. I recommend to use this pan to prepare food which you can to flamed with brandy! The result is perfect. 539 customers found this review helpful. Did you? Yes, I did! Bought a range of Falk pans and have been delighted with the performance. Beautiful, easy to clean and quick to heat. Perfect. I brought this after many months of thinking should I shouldn't I. I am very glad I did. I always used a non stick pan but had purchased a couple of pans from Falk and was very impressed so I took the plunge, the first thing I cooked was fried eggs they cooked perfect and didn't stick,the next was Steak this cooked beautifully again it did not stick and the pan cleaned with only a sponge. I am very impressed I am now saving up for a set of saucepans. Thank you Falk for wonderful pans. 555 customers found this review helpful. Did you? Yes, I did! Besides of fish and steam vegetable, this 28cm frying pan helps me a lot to make Chinese cuisine e.g. frying dumplings and radish cake for 2-3 portions. 564 customers found this review helpful. Did you? Yes, I did! Grilled stakes with a bit of olive oil, and they came out amazing! the size is excellent for a family of four. My frying pan is from the beautiful more modern looking Signature range. Really heavy, the perfect size and with a lovely pinkish copper tone. A joy to look at and to cook with! Crack two eggs in this wondrous pan. It quickly cooks my morning treat! 650 customers found this review helpful. Did you? Yes, I did! This has been used a lot in the short time that I have had this piece. It washes up superbly. Sometimes it only needs a brief soak with fairy liquid to remove more stubborn stains/food particles. The quality is stunning and you really feel that the piece is going to see you through a lifetime of superb performance. Thanks Faulk Culinair..I've become a bit addicted!!! ps. Customer service from Neil was in a class of its own. 578 customers found this review helpful. Did you? Yes, I did! This is a very practical size and we are use it daily. As with all Falk products, it is extremely easy to clean and the brushed exterior means it looks great without having to spend ages polishing. I even take it on holiday! 638 customers found this review helpful. Did you? Yes, I did! A great pan at a great price. I used this pan to cook two steaks on the day this pan arrived. After a short time of cooking and resting the steaks in the pan with the residual heat they were cooked to perfection. 630 customers found this review helpful. Did you? Yes, I did! It is considerably bigger than its little sister the 24cm pan we also bought, so those additional 4cm do make a difference. It is really heavy and it will take a lot of practice and muscle to flit an omelette with it or even sauté some vegetables. I has quite vertical and high sides as the 24cm. When you consider it with the handle it is quite large and could be a problem if your stove is not wide/deep enough. I have noticed the handle gets hot faster than I expected and I always end up using a cloth around it. 608 customers found this review helpful. Did you? Yes, I did! Super professional quality cookware, very happy wife. 725 customers found this review helpful. Did you? Yes, I did! This is an outstanding frying pan! The Falk cookware is a joy to cook with and this is one of my go to pans. I love that because the sides aren't overly sloped outward, I can still fit this pan in my tiny British oven. 734 customers found this review helpful. Did you? Yes, I did! This frying pan is surely among the best you could buy anywhere: incredibly solid, highly responsive, a decent but comfortable size and not least appealing to look at. Unlike cheaper pans which have a tendency to buckle, you can imagine this frying pan being with you for decades. It may not replace a non-stick pan for a few stubborn items like fried eggs and pancakes, but it is my first choice for the vast majority of things. It is also versatile enough for use in the oven. Highly recommended. 698 customers found this review helpful. Did you? Yes, I did! At first sight I was delighted with this pan. having used it it is living up to my expectations and was easy to use and easy to clean. 444 customers found this review helpful. Did you? Yes, I did! Perfect for steak - browns like a dream. Did a aberdeen angus rib of beef steak the other day and it cooked magically. Also used it for tart tartan and it came out of the pan perfectly. I have purchased three Falk pans to date. This frying pan is by far the one which I use most. While using it side by side with a cheap non-stick pan, you can really see the difference - heat spots are enormously reduced and the oil begins to sizzle almost as soon as the pan is put on the heat (something that takes significantly longer with cheap pans). 491 customers found this review helpful. Did you? Yes, I did! This is one of the pieces that I have had the longest, and it gets a lot of use. The size is good for everything from cooking eggs for the family to frying up some spinach or broccolini. I would like the sides to be slightly higher, but everything else is just about perfect. Now that it is seasoned, I have used it for eggs with no sticking problem, and it works great for tortillas as well. 479 customers found this review helpful. Did you? Yes, I did! 476 customers found this review helpful. Did you? Yes, I did! My son was looking for a Christmas present that was a little bit different and suggested I look at the Falk range. The frying pan was his preferred choice and he has raved about it since. A delight to use he is clearly smitten, so much so he has asked for a saucepan for his birthday. It may take a while but I can see the range being in use with him eventually. Always wanted to buy a nice set of copper pans... and when the time came, after copious amounts of research on the internet, Falk Culinair came out as a clear winner... purchased this pan (along with other things) and couldn't be happier with the quality and finish of the product. What's more, website was very easy, as was ordering and delivery was very fast. 526 customers found this review helpful. Did you? Yes, I did! I proved the pan first by heating up with oil and away I went cooking has never been so special for me,the bug has bitten, I will be back for more!! I only received this frying pan 10 days ago, but it is already, a huge part of my working day preparing food, with excellent heat conduction browning meat and cooking a prefect steak, is a walk in the park. 606 customers found this review helpful. Did you? Yes, I did! PurchAsing was simple and delivery very efficient. Elegant, tactile and of superior quality, the merits of this pan are evident before getting near the stove. Even more so afterwards. I ordered a 28CM frying pan and can only offer full praise for this cookware. It took me a bit of time to adjust to cooking with copper, but so far I have cooked numerous types of dish including small curries, fish dishes and breakfasts - with brilliant results. The obvious charm and attraction is the copper itself, but not so obvious is the finish of the cooking surface itself which is great. At the right temperature, it is virtually non-stick and has a distinct metallic ring when used with stainless steel cooking utensils which leave no obvious visible scratch trails on the surface. It also looks great and is very easy to clean. The pan has a tangible 'feel' which I have not experienced with other cookware before (and I have owned good stuff such as Le Creuset). When used with the lid, it cooks perfectly holding its temperature with ease. 569 customers found this review helpful. Did you? Yes, I did! I tried out a full English in the 28cm frying pan and it came up fabulous! For our American cousins that's eggs, sausages, black pudding and tomatoes all nestling together. 595 customers found this review helpful. Did you? Yes, I did! This is a really great frying pan. With normal metals, you don't want to go too big because it's hard to keep the whole surface hot enough without a massive heat source. With copper, no problem. This is the solution to multiple steaks, half a dozen fried eggs, 10 sausages etc... Weighs a ton though, so not for anyone with a weak wrist! 571 customers found this review helpful. Did you? Yes, I did! This Christmas, we presented this to our auntie. Extremely versatile pan. Shallow fry chicken and then make generous quantity of gravy from the fond all in one pan. The lip makes the gravy easy to pour out. Make Spanish omelette with a nice shape because of the interior profile. Fits in most domestic ovens and serves as a baking pan for large quiche, or to roast a joint. The weight is surprisingly well balanced making it quite nimble to use. Astounding non-stick performance! Pancakes and crepes just 'drop off'. Flat base. Perfect, even browning. Unlike another major manufacturer who makes their copper frying pans in 'odd' diameters making it hard to find a lid for them, Falk frying pans have an optional lid which I highly recommend. Adding a lid to your frying pan increases the versatility of the pan and saves you money on the long run. Having used copper frying pans from all the major manufacturers, I can confidently say that this Falk pan is kitchen gold! Masterpiece! I highly recommend this pan as it will last a lifetime making the investment good value compared with buying several other pans. It is a beautiful classic piece that I hang in my kitchen. The copper means it is excellent at distributing heat evenly a across the base. I use it regularly to make and serve paella. 600 customers found this review helpful. Did you? Yes, I did! Falk Cuilinair brings cooking alive. You might not be able to cook like a professional but at least, you'll look like one using this superb quality cookware! Heat distribution across the pan is second to none. Stylish, durable and professional. Pure quality in your hand. Cooked 2 sirloins yesterday and results were very satisfactory. Good size for fish, steaks, chops for 2 to 4. I was a bit nervous about using such an expensive pan but am pleased about how easy it is to clean. 1 year later and I so trust this pan that I don't think twice about using it for anything that I think it can manage. 677 customers found this review helpful. Did you? Yes, I did! 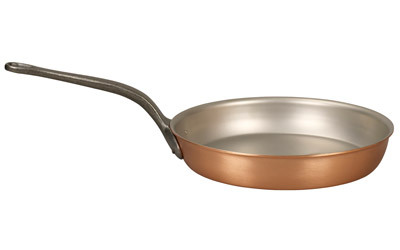 Both the Faulk and Mauviel pans cook wonderfully, but the Faulk copper finish is the best. My Mauviel pan of the same age looks like I found I found it in the trash if not regularly polished, but the Faulk's brushed copper looks great. Highly recommended for great cooking, easy cleanup, and no fussing over regular polishing. Go Faulk! 635 customers found this review helpful. Did you? Yes, I did! This is a pretty specialised bit of kit. As the surface is not non stick, it is not a general purpose frying pan, this is a sauté pan, for frying meat, and then deglazing, and making sauces, for example. Once you realise this you can create wonders in it. There is nothing like heating some oil, dropping some duck breasts skin side down, then when the fat has rendered out, adding bacon, wild mushrooms, liquor and stock to create a splendid one pan meal. We have owned this product for almost a year now. I have found that this frying pan consistently provides excellent heat distribution, is easy to clean and still looks great after a year of heavy use. Highly recommended! 685 customers found this review helpful. Did you? Yes, I did! What can I say, this frying pan is something else. Eggs fry perfectly with just a dash of oil and they never stick! The pan is solid, and I mean solid. It is used everyday and is so easy to clean. 722 customers found this review helpful. Did you? Yes, I did! A real sturdy and well-constructed pan that'll last a lifetime, but by no means is it a sledge-hammer tool. Responds very well to changes in heat and works well for all kind of ingredients from robust to delicate. Love the interior; the best steel interior I've ever use. Well worth the money. 721 customers found this review helpful. Did you? Yes, I did!